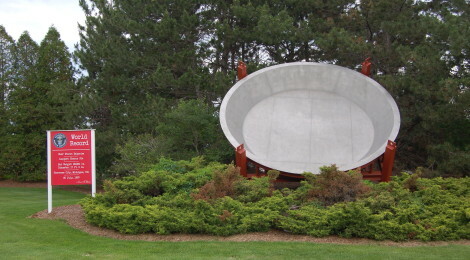 In last week’s Michigan Roadside Attractions post, we highlighted the monument to the World’s Largest Cherry Pie in Charlevoix. 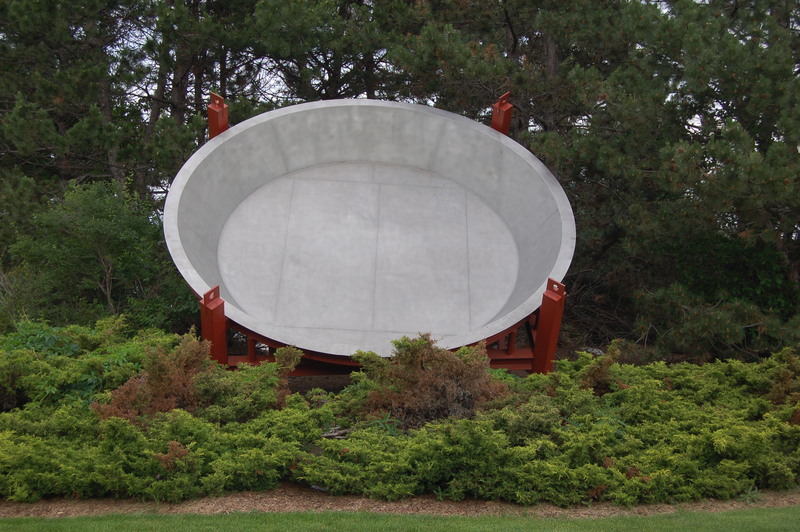 That pie brought the record to Northern Michigan in 1976 with a pie weighing in at 17,420 pounds. 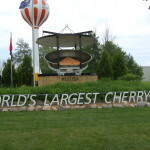 An hour south on US-31, Traverse City was becoming known for its annual cherry festival, and in 1987 they decided to go after the pie record and take bragging rights away from Charlevoix – you can read more about the battle between the two towns at roadsideamerica.com. Today we turn our attention to the World’s Largest Cherry Pie in Traverse City. 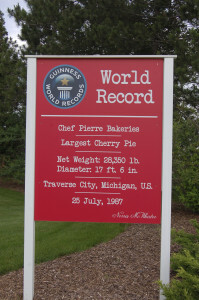 Traverse City’s pie was baked by Chef Pierre bakeries and weighed in at an astonishing 28,350 pounds. 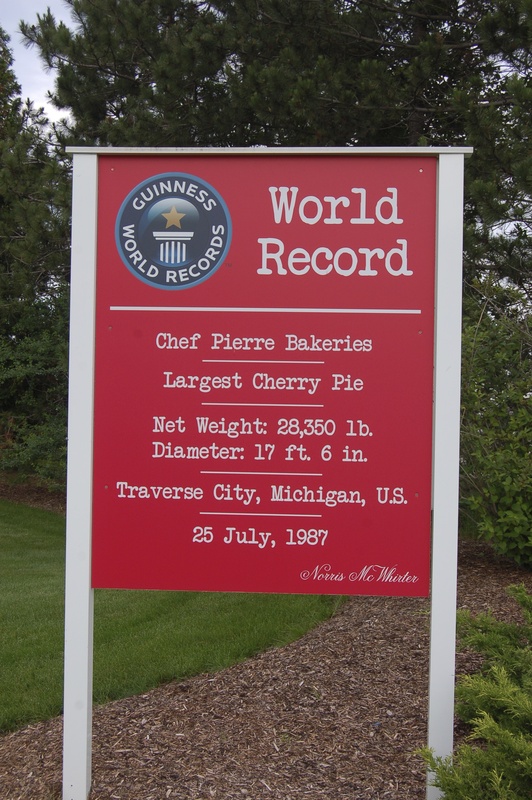 Traverse City took the added step of having their record certified by the Guinness Book of World Records, and the crown was theirs. Chef Pierre bakeries was eventually bought out by Sara Lee, and today the empty pie pan sits on display in front of the bakery at 3424 Cass Rd. 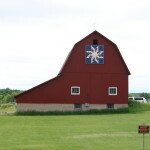 The display presentation here is quite plain in comparison to Charlevoix, but it is still worth a stop and there is ample room to pull off on the side of the road. The 2016 Traverse City National Cherry Festival will take place July 2nd-9th. In 1992, both Michigan towns were left in the dust when a pie from Oliver, British Columbia, Canada took top honors with a 39,683 pounds. 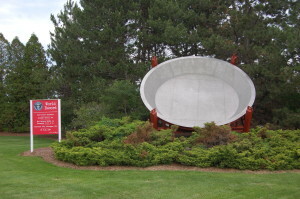 Unlike Charlevoix and Traverse City, Oliver did not preserve its pie tin from the feat so these are at least the two largest pie tins on display in the world. 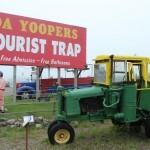 We featured both of these monuments on our list of “Big in Michigan” – a look at our World’s Largest and World’s Longest things in the Mitten State.